Swimming pools might not be the first thing that comes to mind when you think of office space, but that is exactly what one new building owner in Newark, Delaware found when recently purchasing an office. 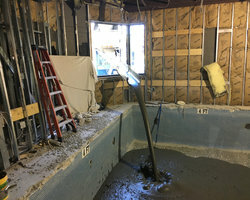 The space previously housed a medical facility that provided aquatic physical therapy, and the building’s existing gunite swimming pool added a unique element to this office renovation project, which was already on a tight deadline. This particular pool presented quite a challenge to the building architect. Because the pool was designed to withstand 62 PCF water, not 120 PCF fill material, the abandonment and fill of the pool had to be completed at or below the density of water. With this unique consideration, the architect specified the use of Aerix’s AQUAERiX pervious cellular lightweight concrete (CLWC) as the fill material for the four-foot-deep pool. 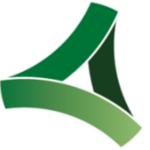 Because AQUAERiX is incredibly lightweight, it was quickly and easily installed within one day. A three-person installation crew from CJGeo installed 60 cubic yards of AQUAERiX, dumping it straight from the concrete truck through a window and into the pool using a concrete chute. The lightweight, self-consolidating properties of the CLWC minimized the likelihood of future differential selement. Filling the pool with a material that was both lightweight and has the appropriate compressive strength that would ensure that the flooring above and around the pool would remain level and stable for years to come. Aerix’s AQUAERiX provided a perfect solution for this unique construction challenge. Filling a swimming pool requires stringent density specifications in order to prevent selement and maintain level flooring, and AQUAERiX provided the strength, density and light weight needed to achieve stable flooring for this new office building. AQUAERiX was selected because it is easy to install and has the stackability, to enabled this project to be completed efficiently, allowing the new owner to occupy the renovated office space as quickly as possible.